better regulations on intellectual property at IPC. The meeting started with presentations delivered by Professor Robert Holyst, Project Coordinator and Professor Wojtkowski, ERA Chair holder on the project status and challenges to be faced by the new ERA Chair. 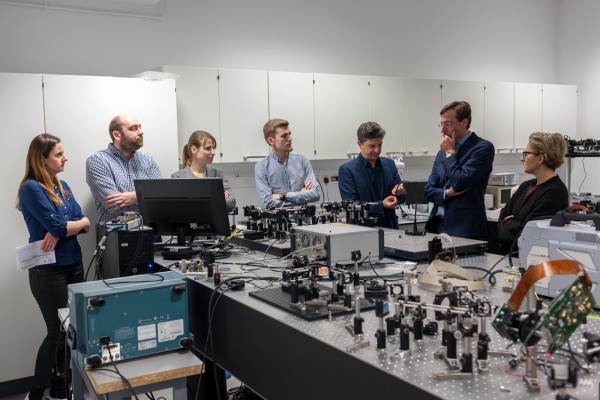 After that our guests took part in a lab tour to laboratories of the Department of Physical Chemistry of Biological Systems (led by Professor Maciej Wojtkowski, the ERA Chair holder) and of synergetic teams (i.e. Microfluidics and Complex Fluids Group, the Soft Condensed Matter Group, the Surface Nanoengineering for chemo- and bio-sensors Group and Laser Center). The recommendations and comments made by our guests will be applied to increase quality of newly established ERA Chair and to enhance its influence on the overall performance of our Institute.